family tree. grandmothers. / genealogy. I eventually got my picture driving licence and it made me think of how I came to change my name and my sense of self, What defines you as a person and how do you define yourself.? Robbie Williams and his wife returned to England to have their baby a few weeks ago week, so their daughter could be English even though he lives in the US. For me, I suppose it is easy, as I was born in Bolton and have never had the desire or the need to live anywhere else. So I am very definitely English, Northern, Lancashire, protestant, working class,……as it was meant in the 1950’s ….ie. respectable, hard working, down to earth,. restrained. All these cultures have influenced my value system and how I view my place in the world. I spent around 20 years researching my family tree. Genealogy is a fascinating hobby, never ending as every time you uncover one layer of a generation there is always more waiting to be discovered. I traced my family back to 1576, when Elizabeth 1st was on the throne.and Francis Drake was planning a sea journey. During that journey I discovered that I was descended from a long line of strong independent women, who overcame adversity in their lives and seemed to be stronger for it. Mostly these women were from my mothers side of the family., These women were inspirational to me. I also take comfort from the fact that many of my grandmothers were married several times like me..
Born in1831, Jane Shepherd, was the youngest daughter of an innkeeper, in a sleepy Yorkshire village of Giggleswick.. She married at the age of 20. My great great grandmother was a widow by the time she was 28. She then married my great, great Grandfather John, a widower with two children. In the next five years she had four children, before sadly John dies of a fever., suddenly laving her alone with 6 children under 10.. Ellen single handedly manages to continue to run his small painting business, employing three men, for the next 10 years. Can you imagine how difficult that would be for a woman in the 1860’s? With her children grown, Jane than came to Bolton with a new husband and starts up first a newsagents business, then a hotel. Sadly Jane is widowed again at the age of 58 and continues to run the businesses until her death aged 80. Some years a go, by an amazing co-incidence, I was in the public library at Nelson, a small town on the Lancashire/ Yorkshire, border, vainly looking for baptism records, when a book literally fell off the shelf in front of me and fell open at a page detailing the gravestones of a local church, There in front of me was an inscription set up by Jane for a headstone bearing the name of John my great grandfather, his first wife Elizabeth, two of his children including my great grandfather also John. I went to the church and found the very large headstone and there also was my great great grandmother Jane ! Two yeas later, Sarah again marries and has another child, a boy, but I discovered the marriage was bigamous and the groom had changed his name. He disappeared to Wigan… and his other family. More scandal and heartache, for Sarah…. The 1901 census five years later finds her describing herself as a “widow” and reverting back to the name of Connor. By this time however, Sarah owns and runs three businesses and properties next to each other. A greengrocer, a confectionery business, also a dressmaking business. Sarah’s mother Elizabeth and female servants also live in the property. Not bad for a woman who was born with all the disadvantages in the world! My great grandmother waited until her bigamous husband died in 1912 before marrying what my grandmother described “the love of her life” Thomas. Strangely she gave the false name of the bigamous husband on the marriage certificate. My dad always said his grandma adored her husband. Sarah died aged 80 in 1939. A rare picture of my “strong women” circa1908. 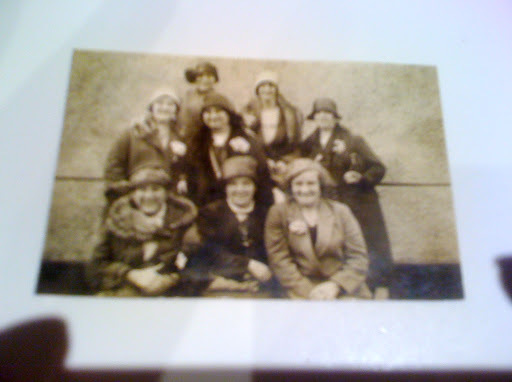 My grandmother is front row right, Sarah her mother is centre mid row and Elizabeth my great great grandmother is front row left, with the fur collar. Comments are welcome. Click on “add a comment ” below and scroll up for the comment box. Or go to the home page and subscribe by clicking “followers” or “subscribe”from the pop out menu from the right hand margin and clicking “join this site” and use google, twitter or Yahoo, or another account you have to join and comment.